Chambers Island lies 7.5 miles northwest of Fish Creek and 11.5 miles northeast of Marinette. The island was named after Col. Talbot Chambers who sailed past it in 1816 on his way to establish a military post at the head of Green Bay. Settlement on the island began in the 1840s and grew rapidly during the 1850s. In 1865 a special committee of the Light House Board was sent to the area to make recommendations for new navigational aids. 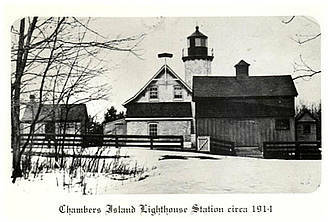 The Committee recommended that a lighthouse be built on Chambers Island to guide mariners through the west, or main channel, from Lake Michigan to the port of Green Bay. The bulk of traffic, at that time, passed west of Chambers Island rather than through the more dangerous Strawberry Channel between the Island and the mainland. In July 1866, Congress appropriated funds for construction, and in May 1867, after some months of haggling, the US Government purchased a forty-acre peninsula on the northwest side of the Island from Lewis and Anna Williams at a cost of $250. In June 1868 the steamer Rocket landed a Light House Board construction crew and construction materials at the site. After clearing the trees from several acres, the crew began digging a hole for the masons to build a rock-walled 26′ x 30′ basement. On the walls they erected a one and one-half story dwelling built from cream colored Milwaukee brick and an attached, 12’x 20′ one-story kitchen wing several feet lower than the dwelling’s main floor. A large square brick chimney near the rear of the dwellings was oriented diagonally to the rear wall. On the first floor there were five rooms, a pantry , and one closet. The second floor had two rooms and a closet. In the northeasterly corner of the dwelling, the masons constructed a three-story brick tower. The first two stories were 10′ x 10′ square with buttressed corners, while the third story to the lantern deck was octagonal in shape. On top of the tower the crew erected a cast iron deck and a ten-sided cast iron lantern. The tower had a brick circular lining and a cast iron circular stairway from the basement to the lantern deck. The keepers used the tower stairs to go between floors as well as to the lantern. In the lantern the men installed a fourth order Fresnel Lens. The height of the tower from the ground to the center of the ventilating ball on top of the lantern measured nearly 45 feet. The focal plane of the lens was 68 feet above the water of Green Bay. Except for the octagonal construction of the top tower, the Chambers Island Light dwelling is almost a carbon copy of the Eagle Bluff Light dwelling constructed at the same time. The towers were deliberately built with different shapes so mariners could distinguish the two lighthouses during the day. On October 1, 1868, the Chambers Island Light shined out across the waters for the first time, with a fixed white light and a white flash every thirty seconds. Chambers Island’s first keeper was Lewis S. Williams, the former owner of the site. Williams remained the keeper until he resigned in 1889 at the age of 69 and moved to Sturgeon Bay. His twenty-one years was the longest tenure of any keeper at the station. Peter Knudsen, who had served at Pilot Island Light and Escanaba earlier, served for two years after Williams resigned. Charles E. Young came from Pilot Island Light to serve for four years before being transferred to the Plum Island Range Lights. Other keepers included Soren Christenson, Joseph Napeizinski, Jens Rollefson, Claude Chapman, and Alfred Cornell. Alfred Cornell was the last civilian keeper at the Chambers Island Light. 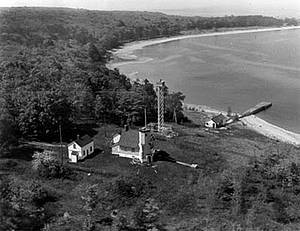 The Coast Guard absorbed the Lighthouse Bureau in 1939, and after Cornell left in 1942, all the remaining keepers were Coast Guardsmen. In 1961, the Coast Guard decided to automate the station to save money. At that time they erected a 97′ steel tower south of the dwelling and put a battery-powered beacon on top. The batteries have subsequently been replaced by solar panels. The lantern was removed from the tower, and the lens is now far from the waters of Green Bay in a folk museum in Nebraska. In 1976, the Coast Guard transferred the station to the Town of Gibraltar for park purposes. Since that time, Joel and Mary Ann Blahnik of Fish Creek have served as caretakers of the historic structure.